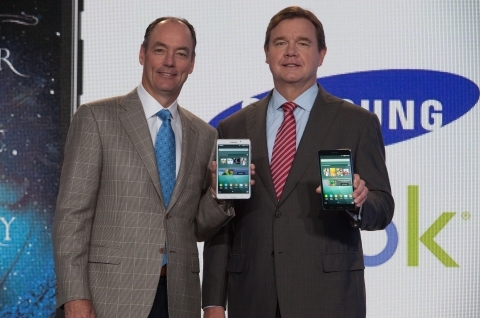 Mike Huseby, CEO of Barnes & Noble, Inc. (right) and Tim Baxter, President of Samsung Electronics America (left) hold the new Samsung Galaxy Tab 4 NOOK, the first full-featured Android tablet optimized for reading, at the flagship Barnes & Noble bookstore in New York on Wednesday, August 20, 2014. This is the first co-branded device from the two companies. (Michelle McLoughlin/Newscast Creative). 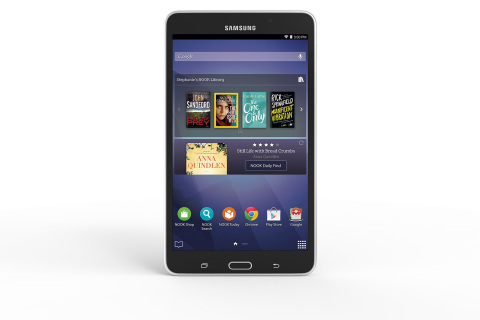 NEW YORK & RIDGEFIELD PARK, N.J.--(BUSINESS WIRE)--Samsung Electronics America and NOOK Media, a subsidiary of Barnes & Noble, Inc. (NYSE:BKS), today announced the introduction of the new Samsung Galaxy Tab® 4 NOOK®, a 7-inch tablet combining Samsung’s leading technology and NOOK’s extraordinary content and reading experience. This new co-branded tablet offers the best of both worlds: the first-ever full-featured Android tablet optimized for reading. The Samsung Galaxy Tab 4 NOOK is now available in more than 660 Barnes & Noble bookstores and online at www.bn.com and www.nook.com for $179 after a $20 instant rebate, and includes more than $200 in free content from the NOOK Store® including bestselling books, popular TV shows, top magazines and more. With tablet tools for everyday use and an endless collection of reading and entertainment options, the Samsung Galaxy Tab 4 NOOK lets readers connect to the world when they need to, and escape from it whenever they want. Barnes & Noble research shows that while the rise of mobile technology, including tablets, has undeniably changed how, what and the ways in which Americans read, they’re doing more of it than ever. Over two-thirds (67 percent) say reading puts them in a better mood. Seventy-six percent of U.S. adults state their reading habits have increased over the past three years, and nearly half, over two in five (44 percent), attribute access to an eReader, tablet or smartphone as the reason. Tablets have not only changed our reading habits, but what it even means to read – personal email (96 percent) is now the number-one item read, followed by social media (67 percent); Web sites, online articles or blogs (73 percent); work-related materials (46 percent); eBooks (31 percent); and digital magazines or newspapers (40 percent). So the Samsung Galaxy Tab 4 NOOK is designed for those who love to read in all forms as well as browse the Web, watch videos, enjoy apps and more. Mr. Huseby added that Barnes & Noble will continue to support all NOOK devices and said that the new product would be sold alongside the popular NOOK GlowLight™ eReader. The new 7-inch device features Samsung’s sleek, ultra-light premium tablet design and all of the hardware specs of its Samsung Galaxy Tab 4. It is lighter and thinner than any previous color NOOK device at 9.74 ounces and .35 inches. Designed to be comfortable to hold, consumers can easily read, watch or dive into any other features or content at home or on-the-go. The crisp, brilliant and beautiful HD display makes it immersive to enjoy books, magazines, games and videos, with long-lasting battery life to match. The Samsung Galaxy Tab 4 NOOK is a high-performance tablet with all of the tools that customers need to stay entertained, connected and productive. For the first time ever, NOOK customers can enjoy one of their most requested tablet features: built-in 1.3-megapixel front- and 3-megapixel rear-facing cameras for photos and video chats. The Wi-Fi® enabled device has the full suite of Google applications featuring Chrome Web Browser, as well as built-in GPS capabilities for location-based apps and more. With Samsung Multi Window innovation, customers can use more than one app simultaneously and share content between apps at the same time, like reading an email and finding a location on Google Maps. Over 3 million books including bestsellers, new releases, classics and enhanced titles with special content. An extensive offering of popular comic books and graphic novels as well as picture-perfect art, photography, travel guides and cookbook titles. An expansive collection of best-loved children’s books – over 9,000 – including chapter books and a selection of picture books with a proprietary interactive experience. The NOOK Newsstand®, with the largest digital collection of the top 100 bestselling U.S. magazines available for both digital subscriptions and single copy sale, and a vast collection of newspapers and magazines from around the world. Find reading tools like ArticleView™ that lets the reader focus on the text, customized to their needs and the Visual Table of Contents that provides a quick scan of the entire issue allowing a reader to jump directly to any article or section. A large collection of NOOK Apps™ featuring a wide range of uniquely curated titles for the whole family, including the hottest games, as well as lifestyle, productivity, news, entertainment and other apps. Discovery couldn’t be easier for all types of content with a bookstore-like browsing experience, NOOK Today, and unique cross-content features based upon customer interests and relevant topics. Hundreds of NOOK Channels™ support expert content curation based on interest and sensibility. This popular discovery feature is powered by Barnes & Noble’s breakthrough recommendation system which combines its bookseller knowledge with advanced algorithmic technology. Barnes & Noble will welcome all Samsung Galaxy Tab 4 NOOK customers with more than $200 of free NOOK reading and entertainment content including three free bestselling eBooks including Freakonomics, The Wanderer, and I Am Number Four, and an episode each of three hit TV shows: HBO’s Veep, NBC Universal’s Hannibal, and BBC America’s Orphan Black. As part of the package, magazine lovers can choose up to four 14-day free trial subscriptions from a selection of 12 popular magazines – including Cosmopolitan, Sports Illustrated, US Weekly and more, and also receive the previous 12 issues of each title at no cost. A $5 credit will also help customers get started as they explore the NOOK Store. More detail on the free NOOK content offer can be found at NOOK.com. Barnes & Noble also offers great complimentary content through its Free Fridays program, offering a free NOOK Book®, NOOK Video or NOOK App each week. For a limited time, Barnes & Noble is also offering up to 50 percent discounts on over 50 top items in categories including books, magazines and newspapers, apps and movies. Visit NOOK.com or the NOOK Store on a NOOK to learn more. Intuitive and user friendly, the Samsung Galaxy Tab 4 NOOK enables users easy access to recent and favorite content and to discover new interests across all content types in one place. Current NOOK customers who upgrade and sign in will find their existing library of NOOK content loaded and ready to enjoy. Right from the fully integrated home screen, get customized recommendations, access the NOOK Store or browse the web. With customizable NOOK Profiles, every member of the family can create their own immersive reading experience, curated and tailored to their individual interest and reading preferences. 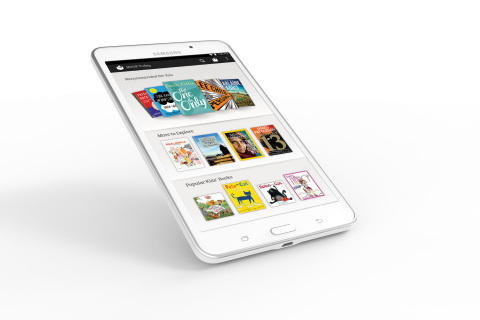 The ad-free Samsung Galaxy Tab 4 NOOK is available immediately in both white and black 8GB models for $179 after a $20 instant rebate at Barnes & Noble bookstores and on BN.com and NOOK.com. Customers can personalize their new devices with a number of NOOK-designed accessories including colorful two-way stand covers and kimono sleeves, an anti-glare screen and more. Experience the new Samsung Galaxy Tab 4 NOOK in a local Barnes & Noble store and learn more from one of the company’s expert booksellers. In store, NOOK customers receive complimentary, personal NOOK support with no appointment needed. While in-store, customers can also receive suggestions on what to read next, access free Wi-Fi, and enjoy the popular Read In Store program, which allows guests to read any book free for up to one hour per day, just like browsing the physical shelves. Customers can also take advantage of a full calendar of popular NOOK events, including NOOK Night workshops, family Storytimes, book discussion groups and author signings. With the launch of the new product, Barnes & Noble is kicking off its #NOOKfaces Contest, encouraging customers to submit selfies, emojis or memes expressing how they feel while reading their favorite book for the chance to win a Samsung Galaxy Tab 4 NOOK or Barnes & Noble Gift Cards. To enter, customers can visit the NOOK Boutique® at their local Barnes & Noble store or submit their entry using the hashtag #NOOKfaces on Twitter and Instagram through September 22, 2014. Learn more at www.nook.com/NOOKfaces. The survey mentioned was conducted online within the United States by Harris Poll on behalf of Barnes & Noble from July 31 – August 4, 2014, among 2,058 U.S. adults ages 18 and older. This online survey is not based on a probability sample and therefore no estimate of theoretical sampling error can be calculated. Complete survey methodology available upon request. Barnes & Noble, Inc. (NYSE:BKS) is a Fortune 500 company and the leading retailer of content, digital media and educational products. The Company operates 661 Barnes & Noble bookstores in 50 states, and one of the Web’s largest e-commerce sites, BN.com (www.bn.com). Its NOOK Media LLC subsidiary is a leader in the emerging digital reading and digital education markets. The NOOK digital business offers award-winning NOOK® products and an expansive collection of digital reading and entertainment content through the NOOK Store® (www.nook.com), while Barnes & Noble College Booksellers, LLC operates 700 bookstores serving over five million students and faculty members at colleges and universities across the United States. NOOK reading and entertainment products make it easy to Read What You Love, Anywhere You Like™ with a fun, easy-to-use and immersive digital reading experience. With NOOK, customers gain access to the expansive NOOK Store® of more than 3 million (US) and 3 million (UK) digital books, plus periodicals, comics, apps, movies and TV shows, and the ability to enjoy content across a wide array of popular devices through Free NOOK Reading Apps™. Find NOOK devices in Barnes & Noble stores and online at www.nook.com, as well as leading retailers including Best Buy, Walmart, Target and many others. NOOK products are available in the United Kingdom at leading retailers; NOOK content can be purchased at www.nook.co.uk. For more information on NOOK, follow us on www.twitter.com/nookBN or www.twitter.com/nook_UK and www.facebook.com/nook or www.facebook.com/nookGB. Headquartered in Ridgefield Park, NJ, Samsung Electronics America, Inc. (SEA), is a recognized innovation leader in consumer electronics design and technology. A wholly owned subsidiary of Samsung Electronics Co., Ltd., SEA delivers a broad range of digital consumer electronics, IT and home appliance products. Samsung is the market leader for HDTVs in the U.S. and America’s fastest growing home appliance brand. To discover more, please visit www.samsung.com.